The Irish Life Health Leinster Schools T&F Championships took place at Morton Stadium, Santry over two days last week (Wed and Sat). Weather conditions on both days were ideal for athletes and spectators alike. 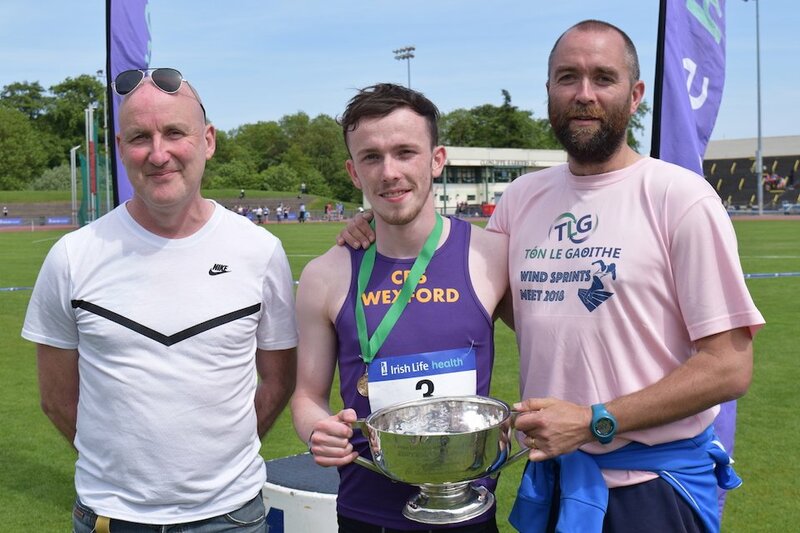 The Leinster Schools has proven to be a happy hunting ground for Wexford athletes in recent years. And so it was again last week with athletes from schools across the county making their mark in all categories from Minor through to Senior. The highlight of the Championships was undoubtedly David McDonald’s Senior Sprint double. The CBS Wexford student was in a class of his own. While it may be unfair to focus on a selection of the great Wexford performances the following serves to give a snapshot of what was a very successful campaign for our athletes: Lystus Ebosele, Coláiste Bríde: Gold in Senior Girls Shot Putt and Silver in Discus. Padraig Hore, CBS New Ross, Gold in Senior Discus and Bronze in Shot Putt. Gold for Ryan Carthy Walsh, Good Counsel New Ross, in Senior High Jump. Gold for Eimear Halpin, Loreto Wexford, in Minor Girls Discus. Gold and Silver for Saidhbh Byrne, Coláiste Bhríde Carnew in Shot Putt and Sprint Hurdles respectively. Gold for Orlaith Deegan, FCJ Bunclody in Minor Girls High Jump. Gold and Silver for Roisin O’Reilly, Loreto Wexford, in Intermediate 1500m and 1500 Steeplechase. That, however, merely gives the tip of the iceberg as there were many others both making the podium and qualifying for the All-Irelands. Starting with Minor Girls, there was Gold in the High Jump for Orlaith Deegan, FCJ Bunclody (1.50m). Rachel Gregg, Pres. Wexford, was 4th (1.40m). Saidhbh Byrne, Coláiste Bhríde Carnew, won the Shot Putt with a best of 9.02m. Sophie Kelly of Pres. Wexford was 6th in the same event (8.01m). Saidhbh went on to the Silver in 75m Hurdles (12.09s). Eimear Halpin, Loreto Wexford, won the Discus with a throw of 25.22m. Aisling O’Brien of St Mary’s New Ross was 3rd with 21.82m. Ciara Mooney, St Mary’s New Ross, was 2nd in Javelin with 25.02m, just 4 centimetres behind the winner. In the 800m Sinéad O’Reilly pulled up, in some discomfort, on the second lap. In Junior Girls, Aoibhinn Crean, Coláiste Bríd Enniscorthy, won Silver in 1200m Walk (6.40.56 mins). Brídín Doyle, Coláiste Bhríde Carnew, was just behind her in 3rd (6.43.49m). Triini Jurisoo, Loreto Wexford, was runner-up in the Hammer (29.33m) while Aisling O’Brien of St Mary’s New Ross took the Bronze (24.34m). Ellie Cooney, St Mary’s New Ross, was 3rd in Triple Jump (9.32m). Elizabeth Gahan, Gorey CS, has shown that she can deliver in the longer distances as well as the sprints. Running the 100m she was unfortunate to miss the podium by one place, finishing 4th in 13.14s. 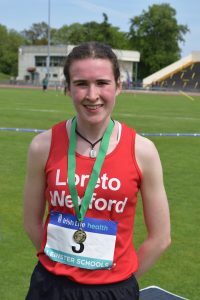 In the 800m Eimear Fortune, Loreto Wexford, was the width of a singlet away from a podium place, her time of 2.27.44m being 0.01s behind the Bronze medal winner. 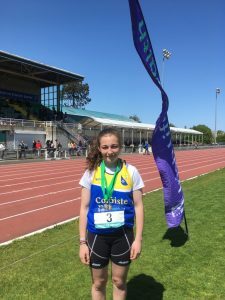 In Intermediate Girls Róisín O’Reilly, Loreto Wexford, started her Leinster campaign last Thursday with a Silver medal in the 1500m Steeplechase (5.23.05 mins). Ahead of her was last year’s All-Ireland Schools runner-up Róisín Tracey. 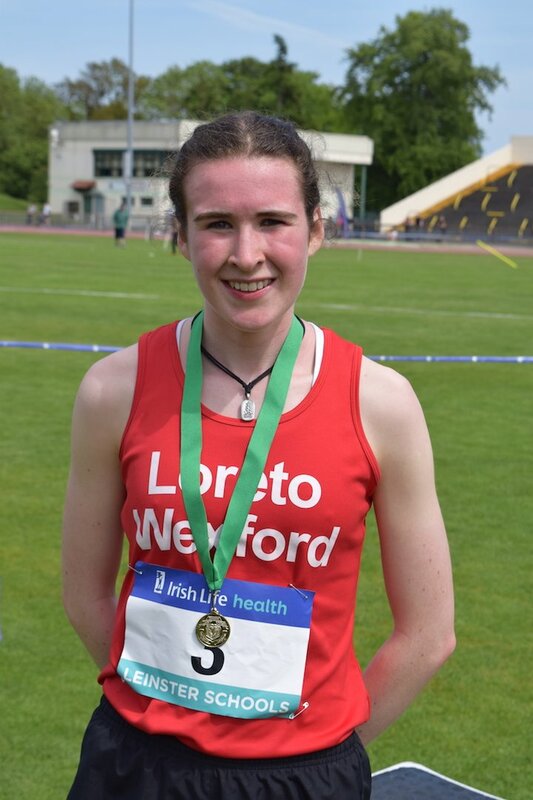 Last Saturday the Loreto Wexford girl went one better in the 1500m when she won a spirited last-lap duel to take the Gold in a time of 4.51.34 mins. She must now choose which race to go for in the All-Irelands. Aisling Kelly, Loreto Wexford, placed a very respectable 4th place in a high class 100m final in a time of 12.33s. Sabia Doyle of Pres. Wexford placed 5th (12.46s), picking up an injury in the process. Danika Gilshinan, Loreto Wexford, placed 5th in 800m (2.29.54 mins). In the High Jump a heavily-strapped Maeve Hayes (Loreto Wexford) was happy to qualify for Nationals with a Silver medal winning 1.50m jump. She will be hoping that the injury that has curtailed her activities over the past couple of months is behind her. There was a 1-2 in the Triple Jump for St Mary’s New Ross with Tara Doyle taking Gold (10.46m) and Grace Cloney the Silver (9.90m). Éadaoín Stafford of Coláiste Bríde was 2nd in Shot Putt with 10.55m and 3rd in Discus with 25.16m. Kate Jackman, St Mary’s New Ross, was 3rd in Javelin with a throw of 28.88m. 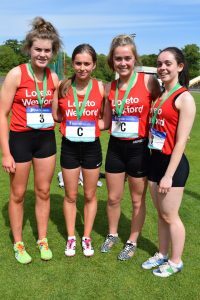 The Loreto Wexford 4x100m Relay team of Liadh Dwyer, April Keeling, Rachel Power and Aisling Kelly took a brilliant Silver behind a very strong St Vincent’s Dundalk team. With a little technical work they should be in the mix at the All-Irelands. Senior Girls had relatively few Wexford athletes taking part but pretty much all of those are serious contenders for podium places at the All-Irelands. Lystus Ebosele, Coláiste Bríde, won the Shot Putt by over 2 metres with a best effort of 11.67m. 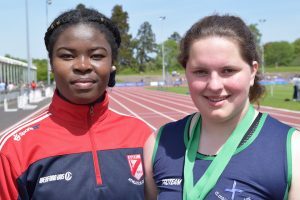 She was also 2nd in Discus with 37.74m with Marguerite Furlong of St Mary’s New Ross in the Bronze medal position (35.14m). Her school-mate Sonya Mooney was 4th in Javelin (23.98m). Amy Forde, Loreto Wexford, was a good 3rd in Hammer with 33.63m. Just behind her in 4th place was Bronagh O’Hanlon, Pres. Wexford (28.95m). Tríona Mooney took Bronze in the 3000m Walk. In the Minor Boys Peter McDonald of Good Counsel New Ross was 2nd in Javelin with a throw of 36.52m. Moving up to Junior Boys, Good Counsel New Ross had a trio of 6th place finishes in Junior Boys. First was Darragh Flannelly in 800m (2.14.13 mins). With the improvements he has made in the past year he would perhaps have expected a higher placing. Evan O’Toole placed 6th in High Jump (1.60m). Finally there was Cormac Byrne in Javelin with a best effort of 31.45m. Nathan Murphy, Wexford CBS, should be pleased enough with his 6th place in U16 Boys Mile (4.51m) as he is still only dipping his toe in the middle distance pool. In the Inter Boys category, Dara Casey, St Mary’s CBS Enniscorthy was 2nd in 100 Hurdles. 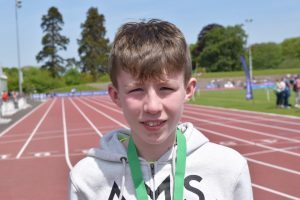 James Hanlon, Ramsgrange CS, took a Bronze in the 2000m Walk (11.00.24 mins); in 4th place was Ryan Kielthy of Good Counsel (11.13.18 mins). Corben Browne, St Peter’s College, was 5th in 1500m Steeplechase. Jack Forde, CBS Wexford, was 3rd in High Jump with a best jump of 1.80m. He picked up another Bronze in Triple Jump, his best of 12.02m being less than 40 cms behind the winner. Jack’s schools-mate Gergely Pap was 2nd in Shot Putt with a best of the day of 12.81m and 3rd in Discus with 33.44m. 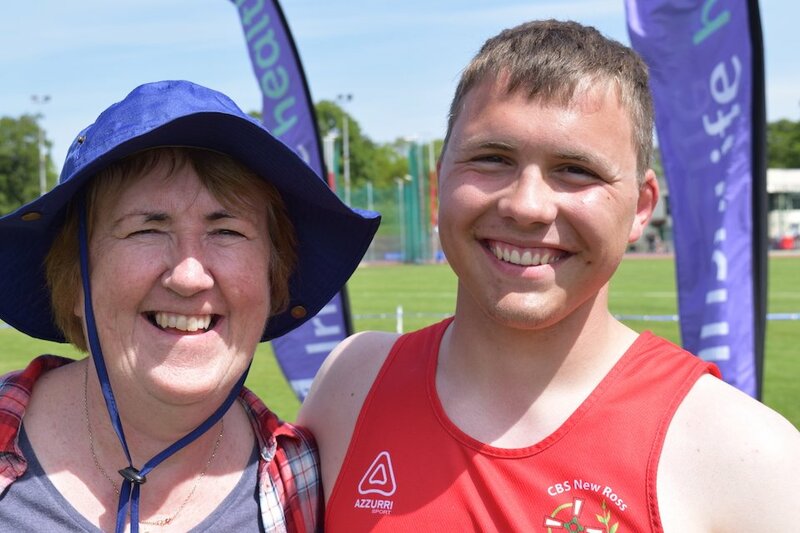 Joshua Hewlett, CBS New Ross, was runner-up in Javelin with a best effort of 53.35m. CBS Enniscorthy placed 5th in the Inter Boys 4x100m Relay (50.28s). The winning time of 44.60s gives them a target to aim for this time next year! Our top result in Senior Boys was, as alluded to above, the sprint double by David McDonald of CBS Wexford. He looked super impressive as he won the 100m in cruise control, his time 10.81s. He then went on to delight the crowd with an exhibition of stylish control and poise as he won the 200m in 21.66s. 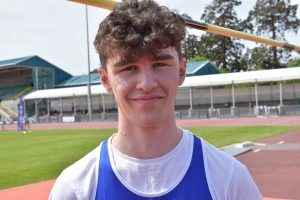 His club and school mate Aaron Tierney Smith was most unfortunate to miss out on a medal in the 110m Hurdles, his 4th place finish (15.25s) being just 0.02 seconds off 3rd place. Ryan Carthy Walsh of Good Counsel won the High Jump with a best of 1.95m, some way off his best. He said that, of late, athletics has been taking a back seat to his Leaving Cert Exam studies. Sensible lad! Padraig Hore, CBS New Ross, won the Discus with a best of 44.24m which put him well clear of the field. He also placed 3rd in Shot with a solid 13.40m. CBS Enniscorthy placed 6th in Senior Boys 4x100m Relay. On June 2 those who have made it out of Leinster will head to the All-Ireland’s in Tullamore. Between now and then it will be all about fine-tuning. Tagged Co Wexford schools excel at Leinster Schools T&F, Irish Life Health Leinster Schools T&F Championships, Wexford Schools athletics. Bookmark the permalink.